The MCIT Employee Assistance Program (EAP) is a risk management tool designed to provide employees of MCIT members and their dependents access to a qualified counselor in an office setting to assist in resolving personal issues that may affect performance at work. This voluntary program provides short-term, no cost counseling services for issues related to finances, work, chemical dependency, stress, relationships and other life concerns. MCIT contracts with Sand Creek for these services. Quick guide lists EAP services, no-cost marketing materials available through MCIT and 20 ideas for promoting the EAP to employees. 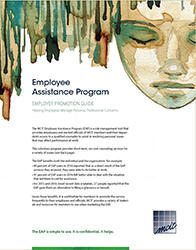 Download Employee Assistance Program: Employer Promotion Guide now. Download posters, mini fliers and e-mails now. Materials are provided at no cost to member organizations to help build awareness of the Employee Assistance Program among their employees. See the EAP Employer Guide for tips and ideas for promoting the program. The job of law enforcement often requires that individuals, their spouses and dependents face personal and emotionally challenging situations. They may feel as if they are alone in trying to manage these. The Law Enforcement Employee Assistance Program provides professional, private support for personal concerns that may affect law enforcement employees’ work or home life at no-cost to them. Many counselors are available who have a law enforcement service background. CONFIDE is a service of the MCIT Employee Assistance Program for county commissioners and elected officials. It provides confidential, professional counseling to support the well-being of these local government leaders and their dependents. Elected office can take its toll on an official’s happiness, peace of mind and family life. This program is designed specifically to aid commissioners and elected leaders and their families during difficult and challenging times. Download the CONFIDE for Elected Officials brochure to learn more. To request printed CONFIDE brochures: e-mail info@mcit.org or call 1.866.547.6516. MCIT provides brochures that members can pass out to their employees and elected officials that explain the employee assistance program and the services it provides. Three versions are available: one for general staff, one for supervisors and managers, and one for commissioners and elected officials. Download a PDF of the EAP employee brochure. Download CONFIDE for Elected Officials brochure. Request PDF of the EAP supervisor brochure: E-mail info@mcit.org or call 1.866.547.6516. Wallet cards can be placed in employees’ wallets so they always have the EAP contact phone number with them. Request printed brochures and wallet cards: E-mail info@mcit.org or call 1.866.547.6516. Supervisors can face circumstances with individual employees or with their teams that present challenges. Sand Creek is available to provide support and consultation for supervisors 24 hours a day. This free, phone-based service is designed to help members sort through concerns and find the best way to respond to employees and manage difficult workplace situations. Qualified counselors who offer a broad perspective and understanding of public entities are just a call away. Request printed fliers or a PDF of the EAP Coaching Services for Supervisors flier: e-mail info@mcit.org or call 1.866.547.6516. If a member has employees who must carry a commercial driver’s license for work, the employer may need the services of a substance abuse professional (SAP). The Department of Transportation (DOT) has extensive regulations that govern a driver’s alcohol and drug use. If a driver violates those regulations (i.e., tests positive on a UA screen, refuses a test or is found in possession), the employer needs to refer that driver to an SAP for assessment and recommendations. This is a highly scripted process the employee must complete prior to returning to any type of DOT safety sensitive job. Sand Creek provides substance abuse professional services at no cost to all MCIT eligible employers and their drivers who have a DOT violation. In addition, Sand Creek coaches employers through that process, so they are compliant with DOT regulations. An SAP assessment provides the employee with a chemical health assessment, clinical assessment tools, recommendations and a follow-up assessment. Sand Creek’s SAP services provide the employer with written documentation of the client’s attendance at an SAP appointment, reports on the driver’s compliance with recommendations and a follow-up testing schedule that is compliant with DOT regulations. This is a multistep process that can take weeks or months to complete, and Sand Creek partners with MCIT members every step of the way. 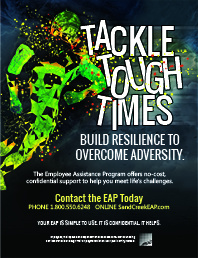 SandCreekEAP.com: Additional resources for individuals and supervisors, such as legal and financial forms and tools, videos for orientation to the Employee Assistance Program, frequently asked questions and newsletters are available through Sand Creek’s website. The Employee Assistance Program: Understanding and Using It: Informational article explains the program in more depth. Use of the EAP Should Be Voluntary, Not Required: Article explains the importance of the voluntary nature of the EAP program to assist supervisors in how to appropriately refer employees to it.